ASGC :: The Union exists to promote golf in the County and to provide competition for the top county players as a route to Midland and International golf. The Association of Staffordshire Golf Captains (ASGC) was formed in 1987 to promote golf in Staffordshire through the Captains of the many member clubs within the County. 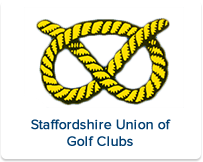 The origin of the Association was at a meeting in 1987 of the Staffordshire Union of Golf Clubs when Andrew Johnston was elected as President and Ivan Forster President elect of the Union. At that time Ivan was a member of both Trentham and Stone Golf Clubs. Always wishing to help, Ivan asked the President if there was anything he would like him to do for him. The reply was “I would like you to form an association for the past Captains of our Staffordshire clubs. Most other Counties seem to have one and I think we should too”. Ivan willingly took to the task and contacted all 42 Golf Clubs in the Staffordshire Union inviting their Captains to a meeting at Brocton Hall Golf Club in June of that year. The ultimate result was the formation of the Association. 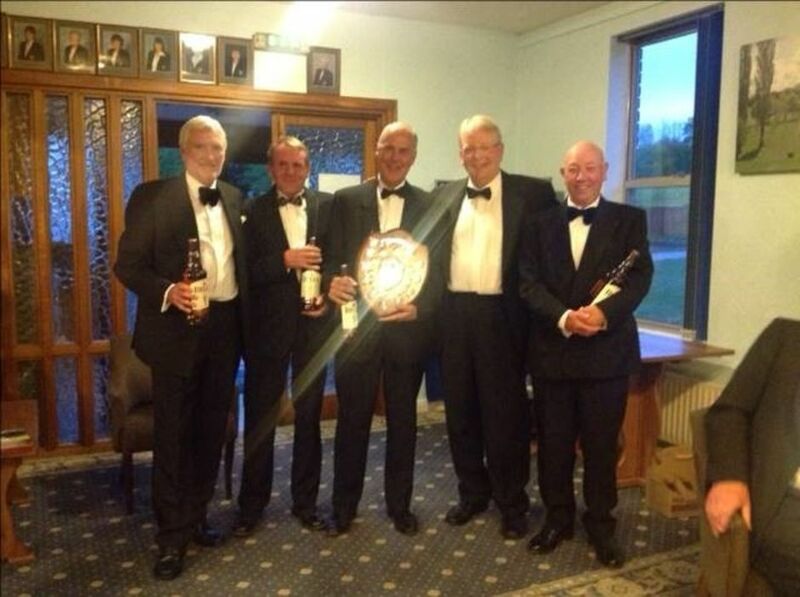 After much debate on the name, The Association of Staffordshire Golf Captains was formed. Of the 42 Golf Clubs invited to join the Association, 21 took up the offer and within one year the Association (A.S.G.C.) had 187 Captains and past Captains as members. At that inaugural Annual General Meeting the joining fee was set at £2 and the annual subscription at £5. Unbelievably, some 28 years later, those fees remain unchanged. Not surprisingly Ivan Forster became the first President of Association. John Cambridge of Beau Desert Golf Club was elected Hon Secretary and Ken Hunt of Ingestre Park Golf Club was elected as Hon Treasurer. 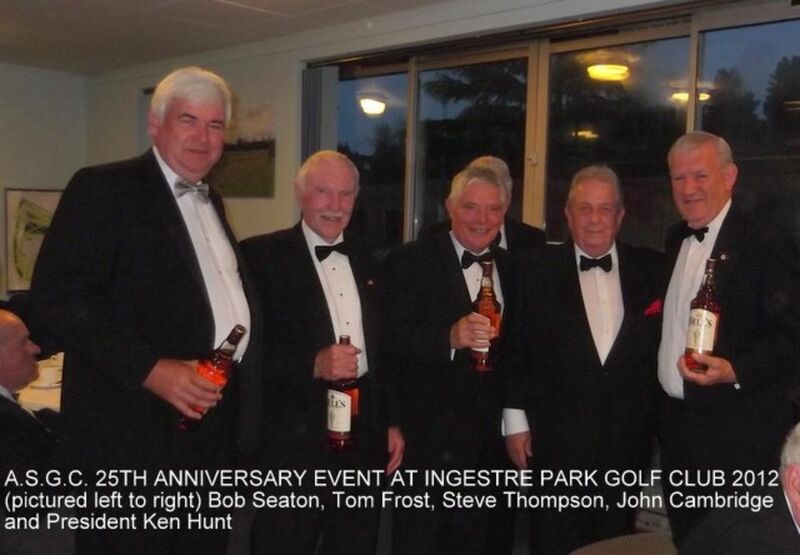 The Associations first event took place at Ingestre Park Golf Club on 9th October 1987 with 64 members playing. For the record, winners on that day were Tom Frost of Ingestre Park - division 1, Paul Bottrill of Bloxwich - division 2 and Ivan Forster of Stone - division 3, Philip Goode of Great Barr won the best gross. Ironically all were later to become Presidents of the Association. Branston, Penn and Sandwell Park offered to host the ASGC events in 1988 and Great Barr offered their course for the following year. In the early years, in addition to the normal events, matches were played against neighbouring counties. These matches were dropped from the calendar in the late 90’s due to difficulty in obtaining venues. The popularity of the Association continues to grow, and today, boasts over 420 members. Four golf events are held every year, the opening event being a team event featuring a gourmet black tie dinner. The Association celebrated its 25th anniversary in October 2012. A return to Ingestre Park Golf Club where that first event took place was almost inevitable and the club did everything possible to ensure that those attending were well looked after. Over 100 members turned out for a golf competition and gala dinner. Somewhat amazingly, featuring amongst the prize winners was Tom Frost who you may remember picked up the division 1 prize at the inaugural event some 25 years earlier. At the 2014 A.G.M. John Cambridge, who you may recall was elected as Hon Secretary in 1987, decided not to stand for re-election after 27 years, yes that’s correct 27 years, in the post. His place as Hon Secretary was taken by Ken Hunt who like John has served continuously since 1987 in the role of Hon Treasurer. Steve Thompson also of Ingestre Park Golf Club was elected Hon Treasurer. 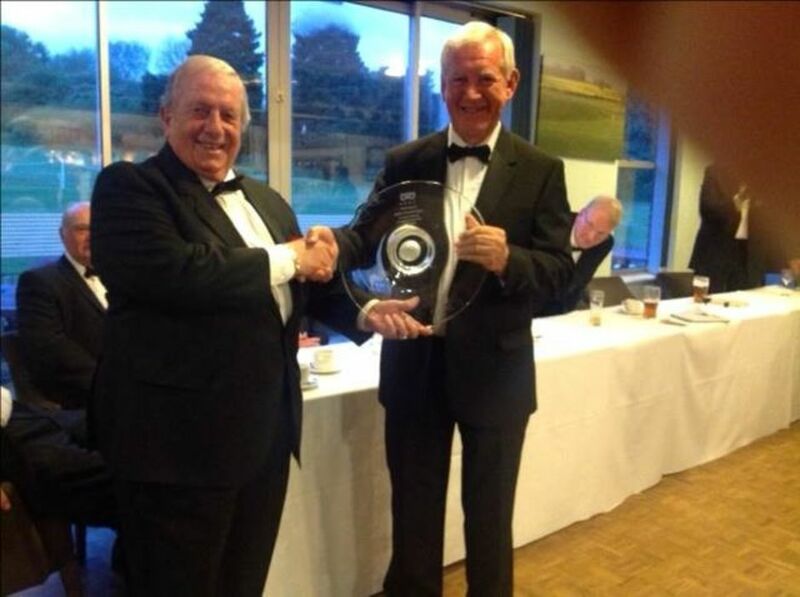 At our opening event of 2015 held at Stafford Castle Golf Club, John Cambridge (pictured below) was presented with an engraved cut glass bowl to honour his achievement and was also made an honorary member of the Association. It is fair to say that the average age of the Associations members has risen, much in line with golf club membership. However one constant is the enthusiasm of our members to attend our four annual events and it is quite normal for all 80 places on offer to be taken up within a few days. An indication, perhaps, of the continuing popularity of an idea, voiced by Andrew Johnston, all those years ago. Click here for a review of the 2016 season. The Mike Connolly Trophy at Beau Desert saw Alan Wood of Uttoxeter take the crown with an excellent 38 points (pictured r.
The Founders Trophy at Drayton Park was a keenly contested event with Trevor Bevan of Beau Desert (39 points) (pictured right) just taking it on countback from David Franklin of South Staffs. 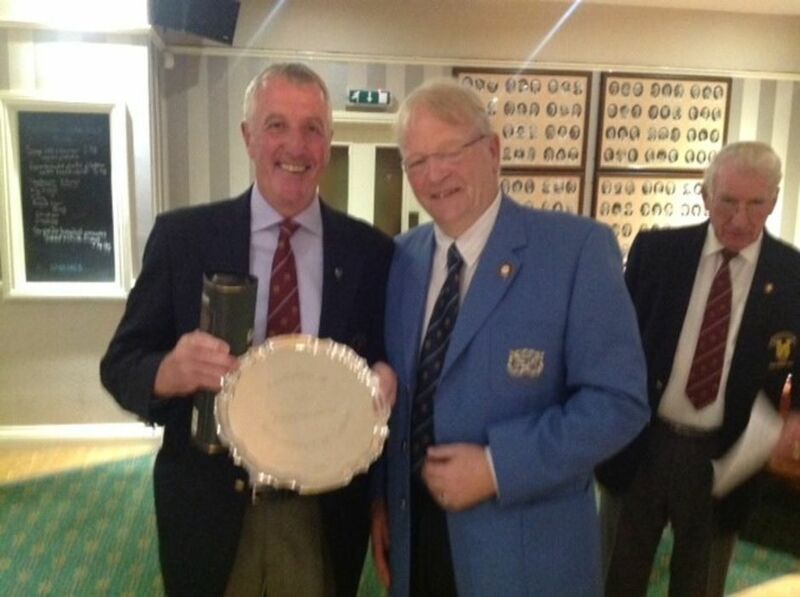 Martyn Pearce of Uttoxeter Golf Club was our final winner of the season picking up the Presidents Salver at Trentham Park Golf ). The golf and dinner was followed by our AGM and the handover of the ASGC Presidency to our new President for 2016, Roger Walker of Sandwell Park Golf Club. 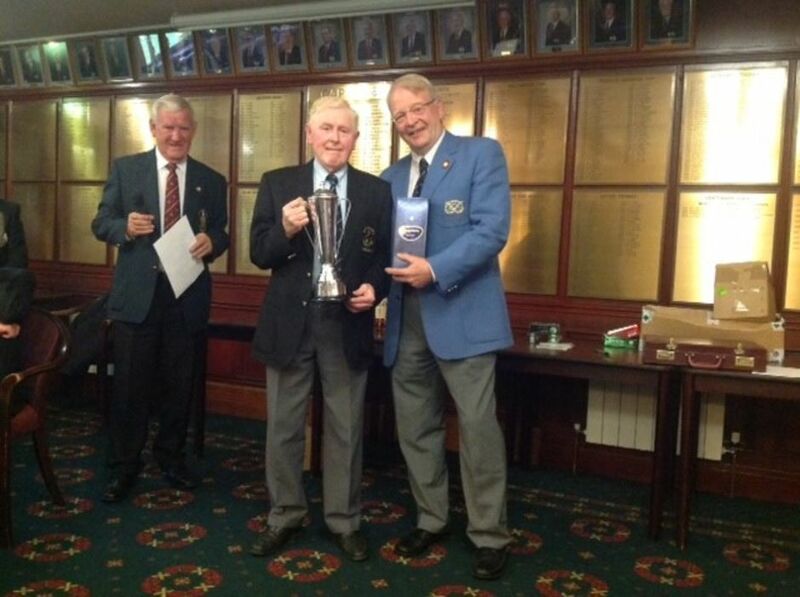 Roger is pictured below accepting the badge of office from outgoing President Iain Rae. 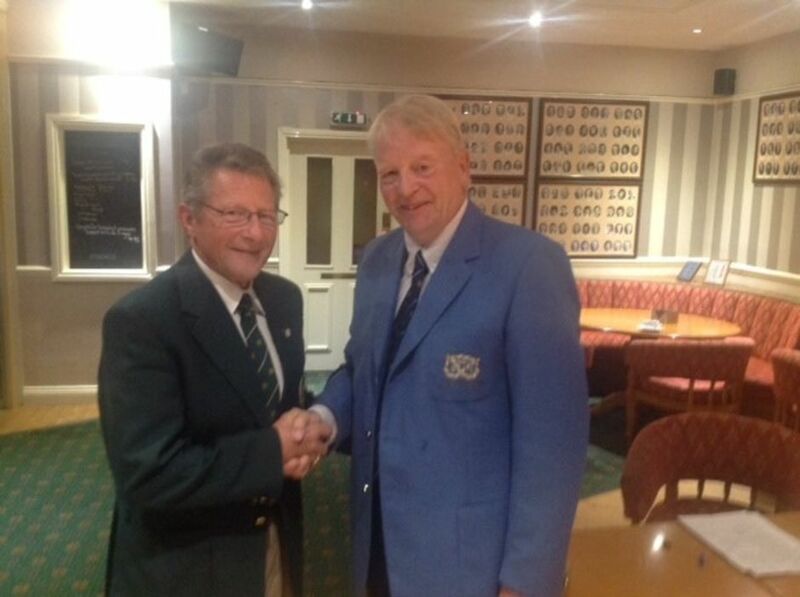 Ken Hunt and Steve Thompson (both Ingestre Park Golf Club), were re-elected as Secretary and Treasurer for 2016. Play got under way promptly at 1pm despite the lack of a shotgun or air horn with 14 teams from around the County. The weather forecasters got things wrong yet again but this time to our advantage. Warm sunshine shone down on the 56 combatants and caps and sunscreen were the order of the day. Competition was fierce and scoring good (for most anyway!!!!). Two teams however excelled and finished tied, 6 points ahead of the rest of the field. Oxley Park and Drayton Park both recorded 84 points and had the scorers scanning the cards to find a winner. Eventually Bill Evans and his assistants came up with a result.